The way to a fish's stomach is through his eyeballs, and fishing lures are objects that resemble any of the naturally occurring foods that fish might find attractive. The purpose of the lure is to use movement, color, and vibration to grab the fish's attention and cause him to bite the hook. Lures also seem to have the purpose of attracting the fishermen's attention. Sport fishing is now a huge business, with over $620 million spent on fishing lures in 1991. Lures fall into several broad categories, each with specific characteristics that catch the fish's attention. All lures have to be kept moving when they are in the water to be effective in mimicking the actions of live bait. Spoons are among the simplest of lure shapes. As their name suggests, they are rounded pieces of flat metal, just like the bowl of a dinner-table spoon. They can be colored or polished on both sides and use flashes of reflected light to resemble minnows. A single hook can be fastened inside the bowl of the spoon, or a three-pronged (treble) hook can be attached to one end through a small hole. A hole at the opposite end is used to attach the fishing line. The weight of the metal makes it easy to cast, troll, and retrieve. Spinners are more complicated in appearance with several parts. A wire shaft forms the spine of the spinner, and it has loops or eyes at both ends, one for attaching the fishing line and the other for the hook. The body of the spinner is fixed along the metal spine. It can be made of a row of colored beads or collections of metal rings or cylinders that sparkle and glimmer. A skirt of hair made from a squirrel's tail may add interest. Near the top eye, a flat metal oval, similar to a spoon, is attached with a fine wire. This oval is called a spinner blade; in the water, it spins around the body to provide fish-luring movement. Spinnerbaits are also known as hairpin lures because they have wire spines that are bent to form a v-shape, much like a spread hairpin. A spinner is wired to an eye at one end of the spinnerbait. At the other end, a hook is concealed in a skirt. The fishing line is tied to the bend forming the two arms of the lure. These lures are relatively large and have two points of action in the skirt and the spinner. Buzzbaits are close cousins of spinnerbaits and have small propellers on one arm instead of the spinner. These propellers attract the catch by vibration rather than flashing light. Plugs encompass a wide variety of lures. Originally, a plug was a piece of wood or cork shaped like a minnow with hooks on the belly and tail. Now the term includes all wood or plastic objects that are shaped like minnows, other baitfish, and other prey ranging from crayfish and salamanders to small rodents. Plugs can be less than I in (2.54 cm) long and up to 8 in (20.32 cm) long. Poppers, also called topwater plugs, float on the water so they resemble frogs or surface-splashing baitfish. Plugs called floater-diver plugs may have several sets of treble hooks on their undersides as well as small metal or plastic scoops, termed lips, near the line end of the lure. This plug floats on the water surface until the fisherman begins to reel in the lure, then it dives below the water surface in imitation of the motion of a minnow. The lip causes the diving action. A crankbait also has a lip that causes it to dive when retrieved, but it has a wider body and dives deeper (up to 20 ft [6.1 m]) with a wobbling motion like the wriggle of a baitfish. Jerkbaits or stickbaits float but don't have any motion-causing devices like other plugs. The fisherman has to manipulate the rod tip to make these plugs life-like. Jigs seem too simple to be true. They are weighted hooks with a lead head right behind the hook's eye. The heads and hooks come in many sizes, weights, and shapes with skirts mounted immediately behind the heads to camouflage the business end of the hook. For jigs (also called leadheads) to be effective, they need to dance on the stream bottom like minnows or crawdads, and the fisherman has to apply the right motion to the rod. This action, called jigging, gives them their name. Jigs are often fished with so-called "sweeteners" that are either live bait or plastic lures. Plastic lures are imitations of worms, bait fish, bottom-dwellers, and even snakes and amphibians. They are molded of soft plastic, often in lurid colors, although blacks and blues seem to be preferred by fish. Again, the motion of the lure and its effectiveness depend on the dramatics of the angler. The caves and remains of habitations of ancient man have been found to hold fish hooks carved out of bone and molded out of bronze. The ancient Greeks and Romans both advocated fishing for sport, as well as for food, but Chinese and Egyptian archaeological digs have shown that fishing rods, hooks, and lines were known as early as 2,000 B.C. , or far earlier than the Greek and Roman civilizations. Bronze barbed hooks were used by the Egyptians; these hooks resulting from the alloy of tin and copper made hard, strong hooks that also could be worked until they were very thin and less visible to the fish. The Chinese spun fine fishing line from silk and used rice and small carp for bait. Claudius Aelianus, a Roman who lived during the third century A.D. , wrote of fly-fishing for trout and other kinds of sport fishing. He made lures of feathers, lead, bronze, and wild boar's bristles and used horsehair and twisted flax to make his fishing line. There is little documentation of advances in fishing tackle throughout the European medieval and Renaissance periods, but, in 1653, Izaak Walton wrote what is probably the most famous book ever to have been penned on fishing. His The Compleat Angler or The Contemplative Man's Recreation described all of the sport fisherman's necessities including fishing line, hooks, flies, and appropriate attitudes. He wrote about fishing for trout in streams in the English countryside, and his poetic style created an ideal that is associated with sport fishing today as well as describing the practical aspects of line and rod. By the 1830s and 1840s in both England and America, the making of fishing tackle began to change from the monopoly of the individual craftsmen to commercial manufacturing ventures. From the early 1900s, the firm of Heddon and Pflueger in Michigan led the production of commercially made lures. These lures were often designed from proven lures that were simply pounded out of old kitchen spoons or whittled from pieces of wood. Rods and reels were handmade by jewelers and watchmakers from the early 1800s. This craft experienced many technical improvements as rod and reel production became commercial throughout the 1870s and 1880s. Advances in fishing line waited until after World War II when braided nylon followed by monofilament line improved the success rate in all types of fishing. Aided by the availability of more leisure time, fishing exploded as a hobby and sport. Materials for the manufacture of fishing lures include metal, wood, cork, and plastic, depending on the type of lure. Most lure-makers, whether commercial manufacturers or amateurs do not make the individual components themselves except for poured lead pieces and some molded plastic. Instead, specialty suppliers make the parts for manufacturers and hobbyists to assemble. Metal parts include hooks, wire, beads, blades, ball bearings, rings, loops, and spacers. Kinds of metal used are stainless steel or titanium, lead, and some brass. Pieces of cut, carved, and shaped wood and cork are used for the bodies of plugs. Plastic bodies are also popular, and many of the ornaments and attractions on lures are plastic, such as skirts and weed guards. Plastic lures themselves can be molded by the hobbyist with simple hinged metal molds and plastic that is melted and poured. While designs of lures fall into some broad categories, as described above, they can also be highly individual. 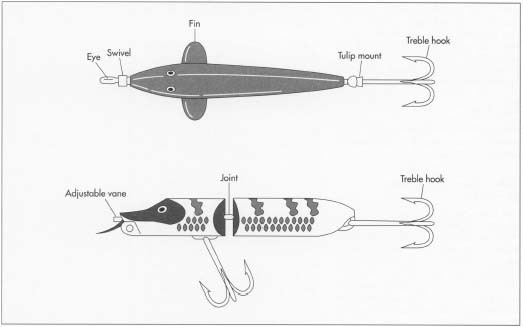 The manufacturing processes for two kinds of lures are detailed below. They are the "pulsator spinnerbait," a product of Nichols Lures Incorporated (one of few lure manufacturers remaining in the United States), and a simple jig. These are two of the most popular lures in use. The spinnerbait originated as a safety pin, and it can be fished on the surface, at depth, at speed, or on the bottoms of streams. 1 Production of the spinnerbait begins with an "R"-bend wire or twist wire. It looks like a hairpin or bobbypin with a hook at the end of one leg and a dogleg bend in the other to form an overall shape that looks something like an "R" at the top. A twist wire is similar except that the top of the bobbypin is twisted around to form an eyelet shape. The wire is connected to the hook during construction of the lead head. The wire and a hook are linked at the hook eye and placed in a hinged mold. The mold has special channels to hold the wire that emerges from one end of the mold and the hook that has its bend protruding from the other side. The mold is sized to suit the wire and the hook. At the join between the wire and hook, the mold has a small cavity that will shape the head. The mold is closed and held by an insulated handle at melted lead is poured into a gated channel at the top of the mold. Mass-producers of lures have centrifugal molds in which a number of lures can be made at once, and the centrifugal action swirls the soft lead into all the nooks of the mold cavities. In the hand-molding process, molded heads are made individually. 2 When the lead has hardened and cooled, the head is finished by hand painting or spraying it, attaching prefabricated stick-on eyes, and finishing the heads with a clear coating that protects them. Usually, epoxy or polyurethane are applied. 3 At the end of the other leg of the lure, a flat metal piece called a blade or spinner is attached to the eye of wire leg. Several other connectors go between the blade and the wire, and the number and selection of pieces can vary considerably. For this example, a ball bearing, small shaft, and split ring are attached to the loop in the wire and crimped down. The blades also have their own personalities; the Colorado is round, the Indiana is tear-drop-shaped, and the willow looks like an elongated willow leaf. The action of the water against the blade causes it to spin in the water and flash in the light. Spinners are die-cut from stainless steel or titanium (for light weight), and sometimes they are painted to add visual interest for the fish. Two of the most popular varieties of spinnerbaits are the double willow or the tandem. Both begin with a wire that has a longer blade end. The double willow has two willow blades. The first one is hung from a cleavis, a horseshoe-shaped device with two eyes that is threaded onto the wire. Beads, a shaft, and a split ring are connected to the wire end, and the second willow blade is added to the ring. The tandem spinnerbait is assembled similarly, except the front blade is a Colorado, and the second spinner is a willow. Again, the combination of beads and connectors can vary depending on the manufacturer's design. Materials used to manufacture fishing lures include metal, wood, cork, and plastic, depending on the type of lure. Most lure-makers, whether commercial manufacturers or amateurs, do not make the individual components themselves except for poured lead pieces and some molded plastic. Lures fall into several broad categories, each with specific characteristics that catch the fish's attention. They include spoons, spinners, spinnerbaits, plugs, jigs, and plastic lures. The spinnerbait and jig are the most popular designs. tied on. They are also available in many colors, sizes, and varieties. 5 The jig is also a lead head. A hook is placed in a lead mold; this mold is different because the eye of the hook will extend through the lead head. The lead is poured, cooled, and removed from the mold. 6 Like the spinnerbait head, the jig's head is painted and finished. A fiber weed guard is placed next to the head to prevent the jig from tangling in weeds or brush. A slip-on collar is fitted on the hook between the head and the bend in the hook, and a rattle is attached. Rattles, again, come in many sizes and forms, and their purpose is to imitate the sound of a crayfish or crawdad under the water. 7 A skirt-keeper and skirt are fastened on the hook. The jig itself is finished, but the jig can also be used as the hook end on a spinner rig to make a jig-spinner combination. Quality control is important to the manufacturer in producing a consistently high-quality product that has been proven in the field. Reputation is a significant selling point in this competitive business. Components are chosen with care. Byproducts do not result from lure manufacture, but the endless combination of components and possibilities keeps the creative lure-maker busy in producing a range of products. Small amounts of lead and metal waste are generated and are disposed; the wasted lead is not large enough in quantity to create a hazard. Similarly, exposure to melted lead or fumes during the head-molding process is not large enough to be measurable and does not present a safety hazard, either to the assembly-line worker or the home hobbyist. Lures have a sparkling future, thanks to the growth in popularity of the sport of fishing, which shows no signs of slowing down. The computer has ventured into lure design, and some of the latest innovations include scent-bearing lures, laser-honed hooks, and exterior finishes that are photographically imprinted and amazingly realistic. The future for lure manufacturers in the United States is not quite so bright. Although lures are mass-produced, the work still involves hand crafting and assembly. Manufacturers cannot pay laborers the mandated hourly rates and still profit, so much of the work has relocated to Central America, Southeast Asia, Taiwan, Haiti, and Mexico. Livingston, A. D. Luremaking: The Art and Science of Spinnerbaits, Buzzbaits, Jigs, and Other Leadheads Camden, ME: Ragged Mountain Press, 1994. Mayes, Jim. How to Make and Repair Your Own Fishing Tackle: An Illustrated Step-by-Step Guide for the Fisherman and Hobbyist. New York: Dodd, Mead & Company, 1986. Almy, Gerald. "Golden oldies: 15 tackle-box classics." Sports Afield (February 1997): 106+. Nichols Lures Inc. http://www.nicholslures.com/ (June 28, 1999). Ray's Fishing Lures. April 15, 1999. http://www.raysfishing.com/ (June 28, 1999). hi, i am doing an english project and some of this info i think is going to help me alot!! !